Christmas decorations can be expensive, but with a little imagination and some supplies that you may already have on hand, you can create your own special look for your mantel. Just follow these step-by-step instructions by special guest contributor Debbie Peavy. 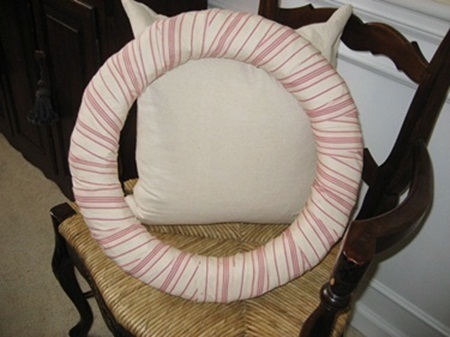 This pretty French ticking and burlap wreath was actually made very inexpensively and from some items that might surprise you! 1. A straw wreath form: I bought mine from a craft store with a coupon for $3.00. 2. One half yard of fabric for the wreath base: I used old drapery panels, so mine was free, plus I had some leftover for another project I will show you. 3. One fourth yard of burlap for the roses: You may already have enough scraps on hand for this as I did. 4. An old sweater in a coordinating color: If you don’t have one, thrift stores are an excellent source. Mine was under $5.00 and I only needed the sleeves for this project. 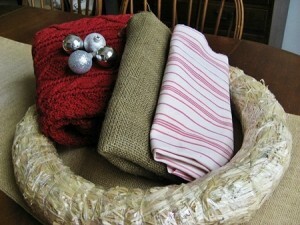 The body of the sweater was used to make a throw pillow! 5: A few small Christmas ornaments If you don’t have any on hand, you can find them in the $1.00 aisle of many stores. Start by cutting the fabric into long 4 inch wide strips. Fasten the first strip to the back of the wreath form with a staple and start wrapping it around the form. 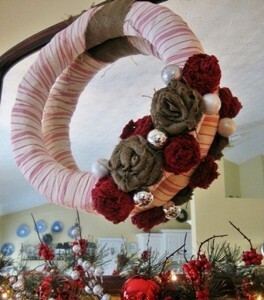 The edges may ravel a little, but this just adds to the vintage look of the wreath. Wrap until you have covered the whole form, using multiple strips if you need them. Finish at the place where you began and fasten it with a little hot glue. The wreath will look something like this. It doesn’t have to be perfect. 1. 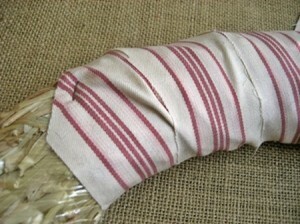 Cut 2 inch wide strips of burlap approximately one yard long. The length of the strip determines the size of the roses. Fold the strip in half lengthwise and tie a knot in one end. 2. Start twisting the strip and winding it around the knot. You can secure it with hot glue as you go to hold it in place. 3. Continue twisting and winding the strip until you have a rose that is the size that you want. 4. 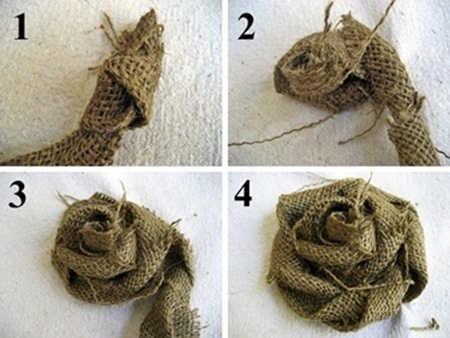 Tuck the end under the rose and secure it with hot glue. Repeat the process above until you have created as many roses as you want. I also used the sleeve of the sweater to make sweater roses to add some color and texture. 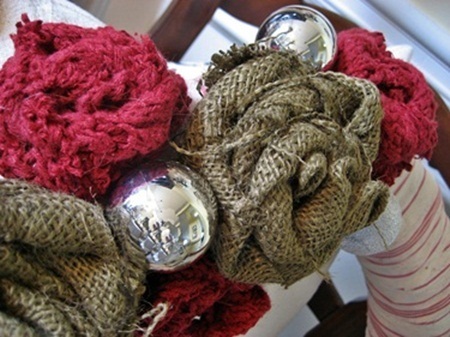 Hot glue the fabric roses to the wreath form and add a few ornaments for a little Christmas sparkle. The finished wreath can be hung using another strip of burlap and the placement of the roses can be adjusted to suit your taste. I like mine off to the side a little. Since I had several leftover drapery panels to work with, I also made matching Christmas stockings and topped them with thrift store napkins that were only $1.00 each! Finally, I added glitter letters spelling NOEL…also only $1.00 each…although you could use your family’s initials. By adding the French ticking wreath and stockings to the garland and candles from last year, I was able to create a whole new look for my mantel. And best of all…I only spent a total of seventeen dollars on supplies! 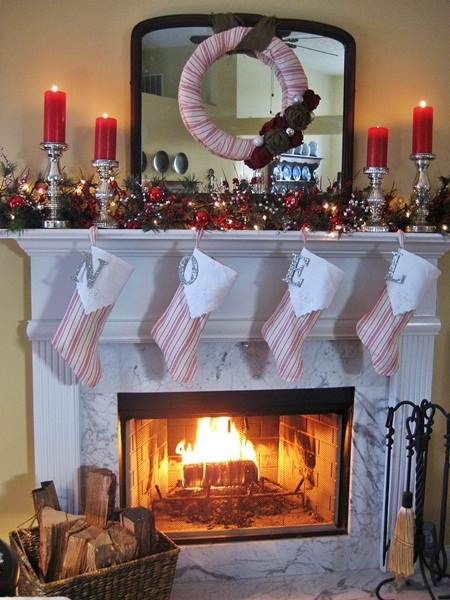 I love the idea of reusing and remixing my Christmas decorations and adding a few new inexpensive touches each year. It’s great way to save money and get to enjoy your decorations year after year! All and text belong to Debbie Peavy and are used with her written permission. 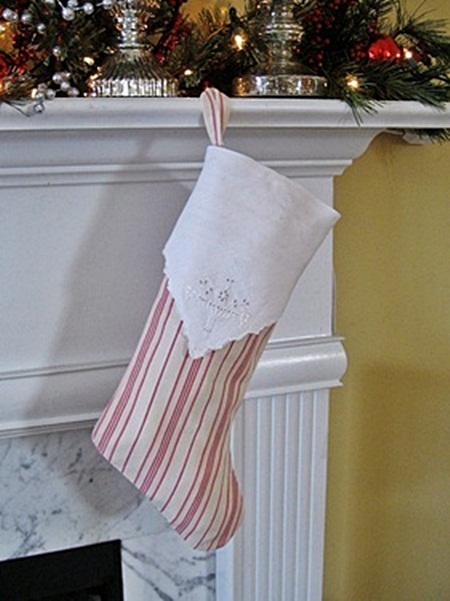 This entry was posted in Decor Inspiration and tagged budget, budget Christmas decorations, Budget Makeover, burlap, cheap Christmas decor, Christmas, Christmas craft, Christmas decor, Christmas decorations, craft, DÃ©cor Ideas, Displays, DIY, easy craft, fireplace, Flea Market DÃ©cor, French style decor, French ticking, holiday decor, holiday decorations, holidays, living room, makeover, mantel, roses, vintage, winter, wreath by Flea Market Decor. Bookmark the permalink.